This is your weekly pulse check on health equity and social inclusion, from both a local and global perspective. Do you have an update or news item to share in next week's Radar? "This webinar will look at the intersection of physical and social conditions in early childhood and how they influence health outcomes across the life course." "Community Conversations will be a series of community storytelling events held by the Intercultural Competence Advantage Program (ICAP) of the Cross Cultural Learner Centre alongside other community partners." "...we will be shedding light on the deeply concerning growth of the wait list for social housing in London. In a period of 5 years, the wait list has grown from 2,807 in 2015 to 4,820 today, an increase of 72%." "The Child Health Symposium is a collaborative presentation of Western University's Faculty of Health Sciences and the Thames Valley Children's Centre... share knowledge, ideas, and best practices for service delivery..."
"This annual event directly addresses issues affecting communities of color — issues too often not fully recognized by professional urban planning and design communities." "Please join us as we share what we have learned through testing a strategy to prevent hospital discharge to homelessness." "Increase understanding of how systems of injustice, including racism and classism, play out in your own lives and the lives of the people you serve." "How can we help support your research program? Join us May 9-10, 2019. Details and agenda to come." "The two-day conference will focus on reproductive coercion, human trafficking, and gender-based violence with experts in the field presenting up-to-date research and practical clinical approaches to working with vulnerable populations." "These two symposia will bring together frontline agencies, topic experts, students, faith-based sector advocates, and social policy champions to examine the meaning, implications, and outcomes of charity and justice models for social support." "The world’s largest conference on gender equality and the health, rights, and wellbeing of girls and women." Life as a Refugee 2019 Theme: Unpacking Myths and Misconceptions about Refugees. Session proposals deadline is 11 March. "Who should attend: Psychiatrists, Family Physicians, Pediatricians, Psychologists, Nurses, Social Workers, Researchers, Allied Health Professionals, Educators and Administrators working with children and youth." "Convention to advance public health in Ontario by increasing the knowledge and skills in the workforce." "The 2019 NABIG Congress invites participants to consider how to advance basic income on the policy agenda at local, national, and regional levels"
"The International Metropolis Conference 2019: the largest annual international gathering of world experts from academia, governments and civil society in the fields of migration, integration and diversity." "The 23rd NNVAWI conference to be held in Malmo, Sweden in June, 2020." 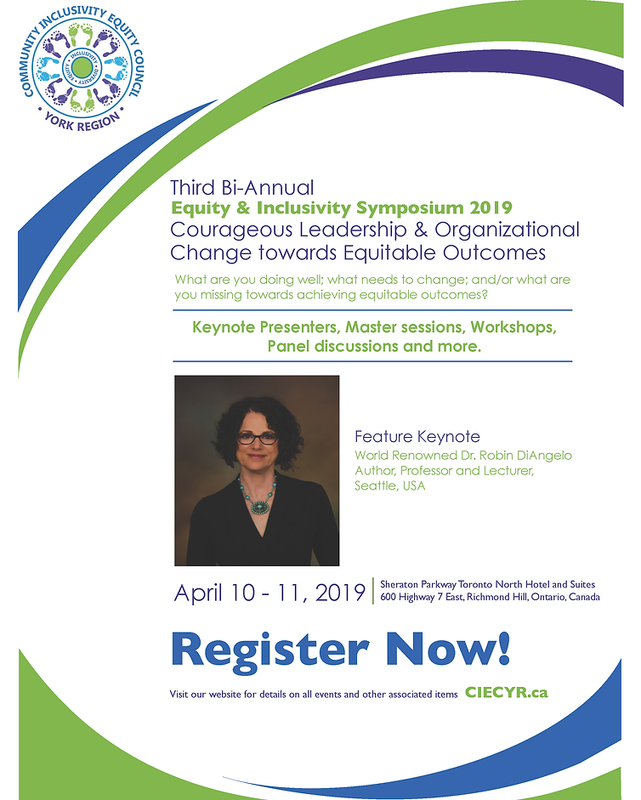 The Third Bi-Annual 'Equity & Inclusivity Symposium 2019' is themed "Courageous Leadership & Organizational Change towards Equitable Outcomes"
The Canadian Knowledge Mobilization Forum will be shifting to a bi-annual schedule beginning with the 2020 event in Halifax, Nova Scotia, June 8-9, 2020, at Pier 21 (Canadian Museum of Immigration). "Our conference will bring together over 600 health care professionals, Indigenous leaders, researchers, physicians and community partners from across Canada to connect with and learn from each other." "The Indigenous component of the Healthy Life Trajectories Initiative (I-HeLTI) addresses the priority issue of non-communicable diseases (NCDs) for Indigenous Peoples in Canada. " "The Planning and Dissemination Grants are intended to provide support for planning and/or dissemination activities consistent with the mandate of CIHR and relevant to CIHR Institutes, or Initiatives." "The goal of the awards is to promote innovative curriculum initiatives that help support international and intercultural learning opportunities for Western students." "Grants that support the evidence-based development of activities to achieve a Priority Outcome." "Grants that support projects at the idea or conceptual stage to achieve a Priority Outcome." "[T]his program supports high-impact, innovative, collaborative initiatives that will create systemic change in the London and Middlesex Region." "The Project Grant program is designed to capture ideas with the greatest potential for important advances in fundamental or a pplied health-related knowledge, health care, health systems, and/or health outcomes"
"The Foundation Grant program is designed to contribute to a sustainable foundation of established health research leaders, by providing long-term support for the pursuit of innovative and high-impact research programs." PEGs "provide short-term and timely support for partnered research activities that will inform decision-making at a single partner organization from the public, private or not-for-profit sector." "Partnership Grants are intended for large teams working in formal collaboration between postsecondary institutions and/or organizations of various types." To "generate opportunities for early career researchers (ECRs) to conduct high-risk, high-reward and interdisciplinary research not available through funding opportunities currently offered by the three agencies." "Insight Development Grants support research in its initial stages. The grants enable the development of new research questions, as well as experimentation with new methods, theoretical approaches and/or ideas." These grants support events and outreach activities geared toward short-term, targeted knowledge mobilization initiatives. "...to capture ideas with the greatest potential for important advances in fundamental or applied health-related knowledge, health care, health systems, and/or health outcomes..."
"Community Resilience Fund (CRF) ... for supporting partnerships and innovation in countering radicalization to violence in Canada." Do you have an update, news item, or event to share in next week's Radar?